We succeeded in development of a new technique to grow a high-quality polycrystalline Si ingot for solar cells named as “Dendritic casting method”, which utilizes the dendrite growth along the bottom of the crucible wall at the initial stage of directional growth. 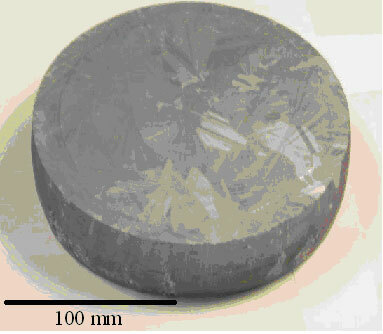 This method permits to obtain a textured polycrystalline Si ingot with large-size grains. Furthermore, its crystal quality was revealed to be highly maintained from the bottom to top in the ingot, which is a great advantage from a view of a material yield. Solar cells based on this polycrystalline Si show high energy conversion efficiencies closing to that of Si single crystal solar cells. Importantly, this growth technique is applicable to the industrial casting method, and our technique has attracted much attention both from the industrial and the scientific fields because it is promising to contribute to the global spreading of low-energy-cost solar cells in the near future. 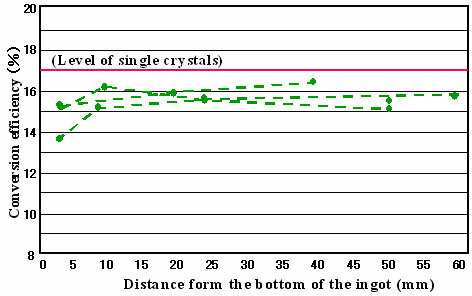 Results of the research have been published in Acta Materialia and Journal of Crystal Growth and reported in a newspaper of “Kagaku Kogyo Nippo” on July 31.